Q Acoustics Concept 40 review | What Hi-Fi? Over the last few years, our feelings towards Q Acoustics have evolved from a pleasant surprise to a deep respect. Despite being a young brand (less than ten years old) it has gone toe-to-toe with long-established heavyweights, and we’ve lost count of the number of Awards we’ve given to it. Despite its success, Q Acoustics never gets complacent. The Concept 40s (and their standmounted siblings the Concept 20s) are a determined move upmarket, bringing a relatively exotic cabinet construction to their price points. What you get here is an unusual box-within-a-box structure. Two layers of MDF are separated by an elastic compound called Gelcore, which turns vibrations in the inner cabinet into heat. The idea is that those vibrations don’t radiate to the outside world to distort the sound produced by the drive units. It works. The level of insight is very impressive. Not only are we treated to bags of detail, it’s also an extraordinarily clear sound. Then there’s the consistency to the way the Concept 40s handle all parts of the frequency range. Tonally, it’s the same Q Acoustics sound we know and love. That means a smooth, highly refined presentation that trades outright excitement for an easy listening experience. The Concept 40s could never beat the Tannoy Revolution XT6Fs when it comes to sheer excitement or finger-snapping glee. Then again, they don’t want to. Q Acoustics instead aims to give you a sound that you can happily listen to for hours on end. It would be easy to dismiss these speakers as overly polite, but that would be a mistake. Unlike the Cabasse Jersey MT32s, these are not too laidback. There are strong dynamics, as well as a pleasing degree of agility. They have no problem making sense of Étienne de Crécy’s dance-happy Smile – certainly not when there’s the kind of hefty low-end that could cause your neighbours considerable grief. There’s certainly a good deal of attack when the occasion calls for it. Orchestral crescendos are delivered with enthusiasm, and there’s plenty of scale and authority to boot. We’re also taken by the Concept 40s’ aesthetics. The design is minimalist and futuristic, and build quality is top-notch. The cabinet is heavy and solidly put together, and finished in high-quality black or white gloss. That machined aluminium faceplate is also a nice touch, giving these speakers a distinctive and modern feel. Positioning is a straightforward affair. Just give them a bit of space (there’s a large reflex port at the back) and toe them in slightly towards the listening position to firm up that stereo image. These speakers aren’t particularly fussy about partnering equipment, although we’d suggest avoiding a system that sounds too laid-back. No doubt about it: these are five-star speakers. Sure, they lack the precision and high-octane entertainment offered by the Tannoy Revolution XT6Fs, but they counter with a very high level of refinement. 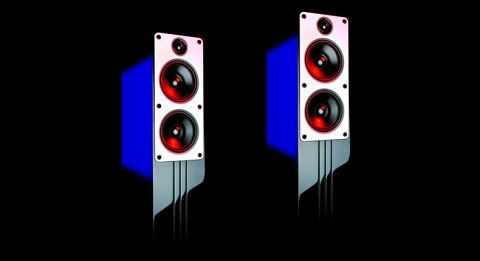 If you want a talented set of speakers with an easy-going, welcoming sound, these must be considered.